Since it was first published over a decade ago, Winning on Appeal has been adopted by top-flight law schools for appellate advocacy courses. It also has become a popular desk reference on how to write an effective brief and deliver a persuasive oral argument. In this long-awaited Second Edition, Ruggero J. Aldisert, a forty-year veteran of the federal appeals bench, fundamentally reorganizes the book. By creating twenty-five chapters in place of the previous seventeen, Aldisert creates a wonderfully instructive how-to manual for the appellate advocate and a must volume for those who select appellate advocates. In the Second Edition, Part 1, "The Theory and Criticisms of Written and Oral Appellate Advocacy," retains the same format as the earlier editions except that the tables of statistics are updated. The book continues its unique approach by consolidating current empirical data on the odds of prevailing on appeal or having a case orally argued. Part 2, "Technical Requirements for Briefs" contains a chapter on jurisdiction as well as a chapter on issue preservation and standards of review. The major revisions to the Second Edition appear in Part 3 and Part 4. Aldisert designed the chapters in these sections to identify discrete requirements for an effective brief or argument, and to explain how to meet these prerequisites. Chapter 23, "How Top-Flight Appellate Lawyers Prepare" is new to the Second Edition. This chapter contains advice from outstanding appellate lawyers, true masters in oral advocacy, on how to prepare for oral argument. Throughout the Second Edition of Winning on Appeal, nineteen current chief justices of state courts, nine chief judges of U.S. Courts of Appeals, more than twenty U.S. Circuit judges, and state appellate judges contribute their thoughts on how to write a brief and how to argue a case-information that is not available in any other publication or resource. 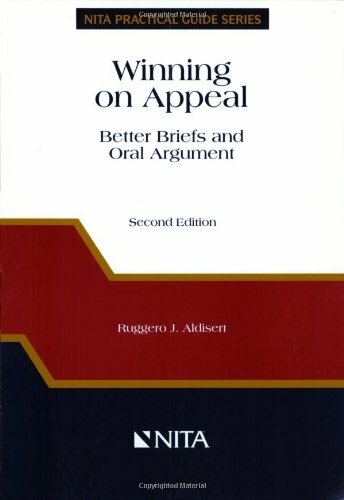 From cover to cover, Winning on Appeal is the quintessential handbook on how to write a brief and argue an appeal. Like removing the back of a watch to see what makes it tick, this book looks behind the bench in appellate courtrooms and behind chambers’ doors to expose exactly what the judges want to read and hear from lawyers. In an easy-to-read style, Judge Aldisert draws the perfect roadmap for the attorney who wants to win on appeal. Aldisert is a Senior United States Circuit Judge of the United States Court of Appeals for the Third Circuit. Hon. Ruggero J. Aldisert, a prominent author and teacher, has been a U.S. Circuit Judge for 35 years. He took senior status in 1987, and continues to sit frequently with the Third Circuit and, by designation, with other U.S. Courts of Appeals. His books include Logic for Lawyers: A Guide to Clear Legal Thinking (NITA 1997), a guide to using legal reasoning to persuade judges and juries; Winning on Appeal: Better Briefs and Oral Argument (NITA 1996), one of the best texts available on the practical aspects of presenting an appeal; the leading treatise, The Judicial Process (1996), now in its second edition; and the leading text on opinion writing for judges, Opinion Writing (1990). Judge Aldisert was adjunct professor at the University of Pittsburgh Law School for 20 years and was a longtime seminar leader for newly selected U.S. Circuit Judges and State Supreme Court Justices.